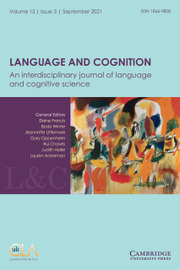 Bilingualism: Language and Cognition is an international peer-reviewed journal focusing on bilingualism from a linguistic, psycholinguistic, and neuroscientific perspective. 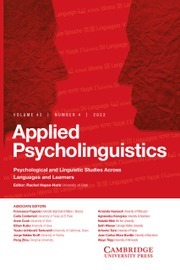 The aims of the journal are to promote research on the bilingual and multilingual person and to encourage debate in the field. 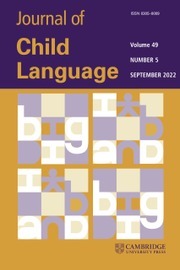 Areas covered include: bilingual language competence, bilingual language processing, bilingual language acquisition in children and adults, bimodal bilingualism, neurolinguistics of bilingualism in normal and brain-damaged individuals, computational modelling of bilingual language competence and performance, and the study of cognitive functions in bilinguals. 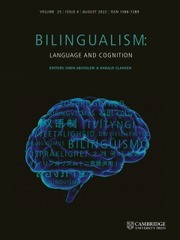 BLC carries articles and research notes on all aspects of the bilingual person, including articles presenting research methods and research tools pertinent to the field of bilingualism.